1992 Australian Touring Car Championship Winner. 5th and final evolution of Gibson Motorsport Nissan GTR's built. Restored and kept better than most by fastidious owner. 2 owners from new with all important documents intact. A red car, that's Blue-Chip. Like Nissan Skyline GT-R's? 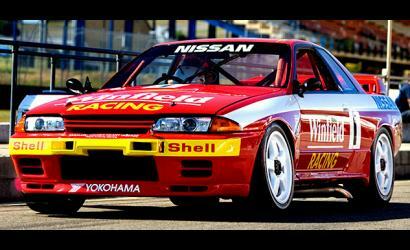 Have a desire to own the 1992 Bathurst winning Nissan Skyline GT-R? Its for sale at Ecurie Investments in Australia No price listed, but its probably more than $0.53. Check out a recent article from Speedhunters for a ton of good photos of the car. GMS built a total of 5, Group A R32 GTR's, with the car we have for sale here, being the 5th and final evolution of everything GMS knew about making the GTR fast and reliable. GMS #5, teamed up with Mark Skaife and Jim Richards, is rightfully famous for winning the 1992 Bathurst 1000 and the 1992 ATCC, but it’s the victory speech given by Jimmy Richards, on the Bathurst winner’s podium, which truly sets this puppy apart from the rest; To my international friends reading this, please picture the winner of Spa, Le Mans, Daytona, Indy, (or wherever you’re from that is your local race of utmost significance and broadcast live on free to air TV), taking the top step, grabbing the Microphone and loudly announcing that the race goers in attendance are “a pack of assholes”. Just the end with the famous quote from Jim Richards.